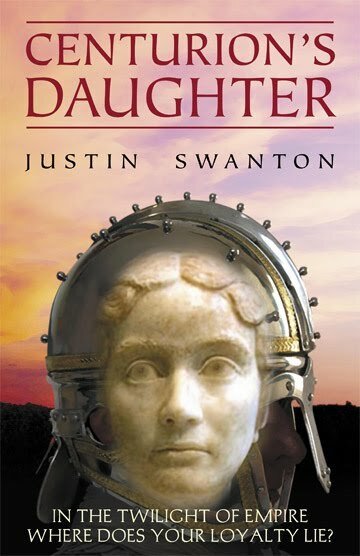 Centurion's Daughter is my debut novel which takes place during the last year of the Western Roman Empire's existence. By AD486 the Western Roman Empire had shrunk to Roman Gaul, itself on the eve of invasion by the Franks under the leadership of their dynamic young king, Chlodovech. As the warclouds gather, a young girl, Aemilia, travels, after the death of her Frankish mother, to Soissons, capital of Roman Gaul, to stay with her Roman father whom she has never seen. She knows only that his name is Tarunculus and that he is a former centurion. She finds an old man, fixed on the past, determined to save the last provinces of Rome. Made a convert to his patriotism, she is caught up in the intrigues of the Roman nobility, desperate to save themselves, and begins to realise that the dividing line between duty and betrayal may not lie between Roman and barbarian. The profound upheaval in her life is mirrored by dramatic change in the world around her, as the old Roman order crumbles and the foundations of Christendom are laid. When I started researching the history of Roman Gaul and Syagrius, its last governor, I found virtually nothing to go on. Most history books I read gave it a single sentence. The only fact the historians agreed on was that the Franks beat Syagrius in a battle near Soissons, after which they occupied Roman Gaul. Peripheral events, like the siege of Paris, were up for debate: was it Clovis or his father Childeric who besieged Paris? How long did the siege last for? Was it before or after Syagrius's defeat at Soissons? I realised after a time that I would have to dig a little deeper and go to the primary sources: notably Procopius and St. Gregory of Tours who wrote respectively about fifty and a hundred years after the events. Then indirect sources, applied with careful reasoning: what was the condition of the Roman army under Syagrius? Could he have received help from the Bretons, and how good were they? Finally the picture emerged, and it is a fascinating one. Everything that happened during this period was of the utmost significance for the future of Western Europe. Every battle that Clovis fought would determine the nature of the Mediaeval world - and ultimately our own civilisation - that came after him. In the east the Byzantine army, under the best general it produced, Belisarius, would dramatically reconquer North Africa and Italy, but these events had no permanent impact. Italy would be lost to the Lombards, North Africa to the Arabs, with the rest of the Byzantine Empire ultimately falling to the Turks. The future belonged to the west, specifically to the Frankish kingdom established by Clovis, and made Catholic by his conversion. This led me to a study of the Church in Gaul at that time, and what I found was really interesting. When the barbarians - Visigoths, Burgunds, Heruli, Franks - occupied the territories of the Western Roman Empire, they did not disturb the social order they had taken control of, but left it intact, contenting themselves with living off its wealth. The rich, capable and highly educated Gallo-roman senatorial class remained in possession of their vast and beautiful villa estates. These were men who had supplied the administrators, generals and even emperors of the former empire. Proud of their Romanity in a way that colonials were proud of being British, they preserved their Roman identity by cultivating a taste for literature and a propensity for a refined form of Latin that became increasingly ornate, archaic and obscure. Living an isolated rural life in their splendid villas, they kept in touch with each other by letter-writing. After a while, some of them realised the futility of dwelling in the past and devoted their talents to the one area still open to them - the Church. The majority of bishops in the late fifth and much of the sixth century came from the senatorial families, and it was they who built up what was to become the Christian social order of Mediaeval western Europe. A number of them became saints - it is in fact a period full of saints. In this work they had a free hand: the Franks and other barbarian rulers did not interfere with the Church in the way the Byzantine Emperors did in the East. It was a time of growth and development for Catholicism, the creation of a society that would culminate in Pepin the Short, ruler of the Frankish Empire, personally dismounting to lead the Pope's horse by the bridle at their meeting, and later invading Italy to save Rome from the depredations of the Lombards. When I started writing this book I did not consciously adopt a 'theme', but just let the story come out in its own way. At the end, though, I realised what the theme was - that the only dependable thing in this world is the Faith, and its embodiment, the Church. Political and social orders come and go, nations and peoples have their day in the sun and then lose it, but Catholicism survives anything. Catholics need to find their identity, their 'worldview', in their religion. Everything else, sooner or later, will go to the wall. Here is a short promotional video on Youtube. A short article on the decisive struggle between the last imperial provinces and the Frankish confederation under Clovis. The result of a careful reading of the original sources plus the recent findings of archaeology. This period, once obscure, is gradually opening up. Enjoy!